The graphics/design/music is better than the effects but the effects are nice enough too. All I mean is, I am blown away by how the demo starts, the transitions, consistent theme, beautiful demo to watch, I like some effects but some others are not as impressive yet still well done. Amazing. Loved this to bits, and it feels more "wicked" in a way than the other demos in the compo. Ace stuff. rulez added on the 2014-02-16 18:00:52 by w00t! Loved this! I got goosebumps several times while watching this at the party. A shame it didn't win. Great stuff, with great art and music! Indeed an excellent demo. Music alone is worth all thumbs up, one of the best soundtracks ever. Great effects and nice tune. what wisdom said. great demo, excellent soundtrack. Amazing prod, with excellent gfx. Some nice graphics, but I found the rhythm badly dosed, most of the effects could have been shown for half the time and that would have made it twice better. 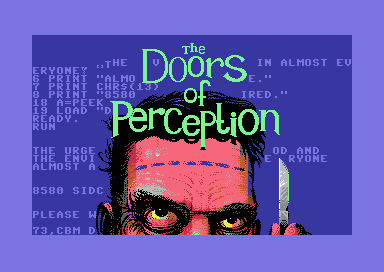 More pure joy from the c64 scene :D Once again, great gfx, music and effects wonderfully packaged. Glenn Rune Gallefoss + Archmage! Freaking ACE! Love the Demo! Moar plz! rulez added on the 2014-02-21 16:37:34 by ɧ4ɾɗվ. the opening gfx is just excellent and sets the standard, super demo. That lead-in was very slick, seemed rushed toward the end but was held up by the strength of the art and that logo treatment. The alpha blend and plasma brain were nicely integrated with the art, point cloud and tunnel are too familiar but still looked nice. Music was effective but sometimes didn't fit the scene (brain plasma), some melody parts meandered a bit. A bit "sluggish" and even a tad blunt at moments, but interesting enough to watch once or twice. The music is what I liked the most, very good "production" :). no shakespeare for me. i respect shape! Well, I'm totally amazed by this demo! I really love the stuff shape is doing these past couple years! Forgotten thumb up!! Great stuff!! page created in 0.020241 seconds with 15 queries.